As Stephen Cummings, ACSW, LISW, director of distance education and field coordinator for the University of Iowa School of Social Work, confronted new challenges with students he supervised in field placement, he became increasingly interested in generational differences and communication between instructors and traditional age social work students who fall into the generation termed "Millennials." He distilled this interest into a central question: As seasoned field instructors get older, and students don't, how can supervision be structured to reduce misunderstandings and enable communication in ways that maximize learning in the field experience, which is the signature of social work education? According to Raines and Arnsparger (2010), the Millennials are the generation born between 1980 and 2000. They are the first group to grow up in the digital age and the new millennium, and are the most racially and ethnically diverse generation in history. Millennials' lives have been demarcated by major tragedies (such as the Columbine High School shootings, 1999; World Trade Center attacks, 2001; beginning of war in Iraq, 2003; Hurricane Katrina, 2005; and the global economic crisis, 2008), as well as by a wave of political activism fueled by social media that had a significant impact on the election of the nation's first black president in 2008. Millennials have grown up on center stage within their own families, with the collective attention of parents, teachers, coaches, and others focused on their achievement and success, and consequently feel both enthusiastic about their ideas and confident about their abilities. They are "connected," which refers not only to the 24/7 nature of their technological capacities but also to their desire to belong and to be a part of meaningful contributions to the world. In the workplace, Millennials tend to respond well to structured environments that provide ample support and direction, as well as nurturance and validation. Their need for nurturance in the phase of early adulthood may stand in contrast to the experience of supervisors who were raised in the cohorts of Generation X and the Baby Boomers, both of which were accustomed to less support than the Millennials tend to expect. In applying this difference in expectations to field instruction, Cummings reflects, "I've become especially conscious of not presuming I'm working with a mirror of myself as a master's level student. My practicum experience—which I don't think was especially uncommon—was a 'make or break' experience in which we were immersed in practice and expected to rise to a new level of competence and professionalism. Today's students generally don't respond well to that approach." Cummings concluded that the answer to improving the supervisory experience for students of the Millennial generation was to intentionally structure a more rigorous holding environment. He believes the Council on Social Work Education contract for field instruction provides the ideal model to edify such a structure, with clear linkage between the curriculum and the field. Additionally, recent work in the areas of attachment theory and developmental processes offers further theoretical background. The quality of the supervisory relationship is widely understood as the vehicle of successful supervision. Writing in the Journal of Teaching in Social Work, Bennett and Deal (2009) expand the discussion of the supervisory relationship to explore concepts founded in attachment theory, as well as developmental stages of student learning in the field. They find that attachment traits and developmental states may be important variables that contribute to the success of the relationship, and consequently to student learning. The core ideas of attachment theory, developed from the work of Bowlby and Aisworth, are that humans have lifelong, biologically based needs for security and attachment to a primary caregiver, and that early attachment patterns influence relational styles throughout life as children internalize working models. The concept of a "secure base," which has been applied to the relationship with the supervisor, describes the foundation that attachment figure provides, from which the student can explore the surrounding environment, and return to the security of the attachment figure. Based on the highly validated Adult Attachment Interview, adult attachments can be characterized as autonomous, dismissing, preoccupied, or disorganized/unresolved. Bennett and Deal believe knowledge of attachment types in both the supervisor and the students is relevant to understanding "innate attachment capacities; behavioral indicators of secure versus insecure attachment styles; the maintenance of the supervisory working alliance; and how to handle separation and loss during termination from clients, the supervisor, and the field practicum." 1. The student begins with high anxiety and a simplistic understanding of the helping process. Students tend toward concrete interventions, with high dependence on the supervisor, who is often viewed as "all knowing." 2. The student searches for the "magic words" of treatment interventions and tends to imitate the supervisor. In this stage, the student's ability to comprehend complex circumstances and the treatment process is underdeveloped; this often leads students to act prematurely. 3. In the third stage, the student desires more knowledge and frequently develops disillusionment and conflicted feelings toward the supervisor, especially related to the level of independence vs. dependence on the supervisor. 4. As the student develops internal resources, more self-confidence and a better understanding of the treatment process, the student often becomes more self-revealing and able to enter into a collaborative relationship with the supervisor. Bennett and Deal recommend that supervisors should be familiar with the four stages of development and cognizant of the attachment patterns that influence the student's ability to internalize the learning environment and mature. In addition to the student's readiness for the field placement, the supervisor's commitment to student supervision has a significant effect on the learning environment. As practicing social workers increasingly find themselves in environments of declining resources, taking on a student whose learning style may demand more time and energy can be a challenge. In an effort to understand commitment to student supervision among field instructors, researchers tested the Investment Model (which consists of six components related to supervision: rewards, costs, degree of investment in the job, quality of alternative jobs, satisfaction of the job, and commitment to the job). Peleg-Oren, Macgowan & Even-Zahav (2007) found that "the greater the rewards, the greater the field instructors' commitment, investment, and satisfaction." This finding is especially relevant to retaining seasoned field instructors. The authors conclude that reward structures for field instructors that meet various needs at different stages of their careers is important, and is likely to lead to more effective field supervision. Nancy Chertok, AM, director of field education at the University of Chicago School of Social Service Administration (SSA) addresses the demands of field instruction at an early stage of the vetting process when working with new agencies and instructors. "Even with all the strengths I believe today's students bring, their enthusiasm can be demanding, and it is important that field instructors are prepared to provide the structure that enables our students to thrive." SSA also utilizes field consultants, who are staff liaisons between the agency, field instructors, and students. Often, Chertok says, the liaisons become involved in coaching students to advocate for their needs. Students often have ideas about their educational goals and seek appropriate ways to discuss their questions and ideas with their direct field supervisors. Chertok sees working with field instructors as a process of developing social work educators. SSA provides orientation and training programs, as well as professional development offerings that are open only to active field instructors. These programs, hosted by SSA faculty and field staff, are tailored to timely, relevant issues (often generated from listening to the needs of field instructors) and offer mentoring, networking, and a connection to the university that the instructors find valuable. Chertok cites high retention among field instructors and attributes it to a combination of both the rewards of working with students and the effects of the relationships with other social workers and faculty whose commitment to the field creates mutually beneficial dynamics. Technology has added another layer of complexity to most areas of social work practice, and student supervision is no exception. While Millennials are often credited with technological savvy, Chertok maintains that it is important not to automatically assume the threshold of proficiency. "Not all Millennials have had the same access or same level of privilege. It is important that orientation programs start from a basic level of knowledge and accelerate accordingly to meet the needs of the actual students in the room," says Chertok. In addition to teaching the technology of any learning platforms utilized for academics, both Cummings and Chertok note the expanded role their institutions have taken in education on confidentiality and ethics with regard to technology and social media. 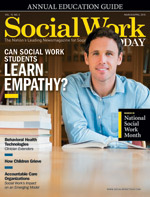 Ultimately, the challenges of educating social work students in the field boils down to concepts to which social workers of all generations are accustomed: engagement, building on strengths, and working toward collaborative goals. Bennett, S., & Deal, K. H. (2009). Beginnings and endings in social work supervision: The interaction between attachment and developmental processes. Journal of Teaching In Social Work, 29, 101-117. Peleg-Oren, N., Macgowan, M., & Even-Zahav, R. (2007). Field instructors' commitment to student supervision: Testing the investment model. Social Work Education, 26(5), 684-696.